What’s the Best Novel You’ve Read This Year? I almost didn’t read what is now one of my favorite books of 2017. A few months ago I was browsing Amazon in search of a fantasy novel when I noticed a book called Age of Myth. Both the name and the cover art screamed “generic fantasy,” so I almost moved on…but then I noticed the comparison to Brandon Sanderson and the wealth of 5-star reviews. So I dug a little deeper. While reading the author’s introduction, I found that I appreciated both the process described below and the transparency. The final point was really refreshing to read. A fantasy series with a certain beginning and end…because it’s already been written in full? Brilliant! I’m happy to report that Age of Myth is everything I want in a fantasy novel: It focuses on a few interesting characters that you genuinely care about, it reveals a vast world at a reasonable pace, it’s funny at the right times and serious at the right times,and it builds to an epic conclusion. I’ve discovered that the author, Michael J. Sullivan, had previously written several other novels in the same world (thousands of years apart). It’s been fascinating to revisit the same world through such different perspectives. What’s the best novel you’ve read so far this year? This entry was posted on Monday, May 22nd, 2017 at 9:41 pm	and is filed under books and tagged with books. You can follow any responses to this entry through the RSS 2.0 feed. Interesting, I didn’t know that was Michael J Sullivan’s style. Definitely a cool approach, and while it might be too risky or difficult a method for many authors, it’s nonetheless awesome for a consumer. I’ve read his other books, the Riyria Chronicles, which I believe these books are a prequel to? I’ve toyed with the idea of giving this one a shot, although I only found the Riyria chronicles “okay.” I’ll certainly keep an eye on the following books in the series though, so see if they continue to garner such good reviews. The best book I’ve read so far this year is probably The Martian, which managed to be even better than the movie. It got me on a bit of a Mars/Science kick, so I’m now reading Kim Stanley Robinson’s Mars trilogy (on the 2nd book presently). Yep, the Riyria Chronicles are a sequel, and that’s what I’m reading now. I really enjoy them. While I was looking up Age of Myth on Amazon for this article, I noticed that Andy Weir (author of The Martian) has a new book coming out this year. I pre-ordered it instantly. Awesome. I love the liberty it seems to give the author. Have you considered translating this approach into the world of board games? Trev: I think the equivalent would be designing a game and several expansions in advance, which some designers do. I tend to put all my time and energy into making the core game as good as it can be, then I revisit it with fresh eyes later for expansion ideas. I’ve had Age of Myth on my “Want to Read” shelf on Goodreads for awhile now and I think I’ll pick it up now. 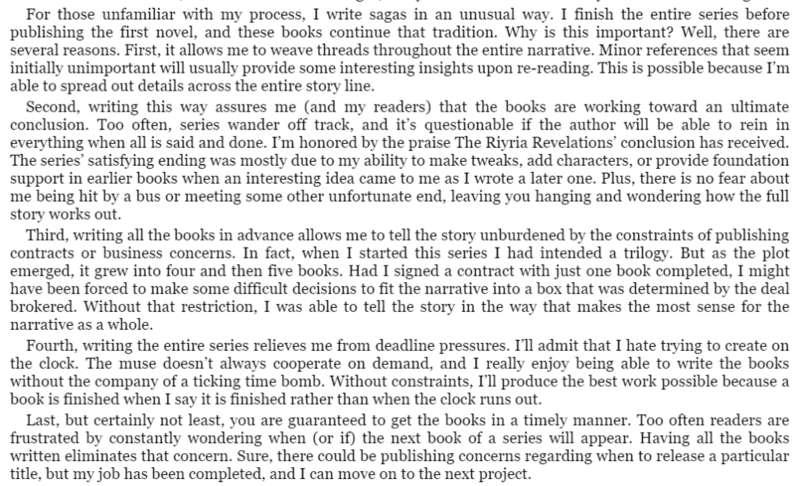 I like that the author took the time to tell us about his process. I also like that, as a writer myself, it speaks to something I spend a good deal thinking about. My best book of the year so far as been Words of Radiance: The Stormlight Archive #2 by Brandon Sanderson. Sander’s fantasy is original and well written. He doesn’t write everything in advance, but that’s okay because he has a wealth of books already published and writes them so fast it’s incredible. You’d simply never expect this level of quality from someone who outputs so quickly. I’m glad you’re enjoying the Stormlight Archive! I can’t wait for book 3 later this year. I agree that Sanderson does a great job at keeping a steady, fast pace, and he’s transparent about his process on his website. I read Age of Myth on a flight home from Europe last week. I thought it was well written and an interesting world, though it does fall victim to a few of the Fantasy tropes, and I’m not a huge fan of magic that gives unlimited power seemingly without cost. It was still a good read and I’m looking forward to the next in the series. This year is the year of the re-read for me. I Re-read the original Mistborn series, with the Mistborn Secret History Novella mixed in chronologically. It was even better the second time around. My friends and I will also be re-reading the first two Stormlight books together in the leadup to the release of Oathbringer this fall. My favorite new book for this year is the Bobiverse books by Dennis E. Taylor. (We are Legion: We Are Bob). A fascinating read about a human mind that becomes the consciousness inside a computer. A little rough around the edges, but classic sci-fi fun that feels a bit like something Asimov or Clarke would have written. If you like Brandon Sanderson and you haven’t read Brent Weeks yet, you should. His Lightbringer series is on par with a lot of what Sanderson has written. Thanks for sharing, Adam! I can see what you’re saying about magic without consequences. I haven’t heard of Brent Weeks–I’ll check out a sample.